the best stand-mounted speaker Ive heard in my system." Sound "In my room, the 201/2 reached firmly to under 50Hz -- as low, really, as any stand-mounted speaker can be expected to without sacrificing too much sensitivity -- and then reproduced everything from there on up with as much transparency, clarity, and detail as Ive heard from any dynamic speaker." "Despite the neutrality and high degree of detail theyre capable of, the 201/2s didnt come across as cold, clinical robots, as some linear, highly revealing speakers do. Instead, they were surprisingly fleshed out and well textured, making voices sound rich and lifelike." " "where the tweeter driver is located within a larger cone-based driver, occupying the space normally reserved for the dustcap." In the case of the 201/2 (and all the KEF Reference models), its a 1" titanium-dome tweeter that delivers the highs inside a 6 1/2" cone thats used for midrange frequencies. Fourth-order slopes cross over the drivers at 2.5kHz."
. Youll also see three small screw-in devices that offer a very welcome feature: high- and low-frequency contouring." Value "While $5000 is quite a lot of money for a speaker that needs to be propped up off the floor, it certainly isnt too steep a price for the 201/2 when you realize that you can pay a whole lot more for a speaker and get considerably less. Furthermore, I dont know of a speaker priced less than the 201/2 that offers the same collection of strengths, even among the many so-called 'giant-killers.'" Back when I was just a budding teenage audiophile -- over 25 years ago now -- the KEF brand name was a big deal. Founded in 1961 by Raymond Cooke, KEF was synonymous with the best of the best from Britain. KEF speakers were celebrated as much for their technical merits as their sound quality. In fact, KEF speakers often became industry benchmarks -- you just have to think back to the original 104, 105 and 107 models, along with the various iterations of those speakers that followed. In recent years, however, the KEF name hasnt held the same sort of appeal, at least not here in North America. I dont know enough about the British hi-fi biz to know what happened. However, when I saw KEFs new Reference-series speakers debut at the High End show in Munich earlier this year, it was clear to me that the company was positioning itself to win that renown back. Enter the Reference 201/2, part of the Reference lineup (the 207/2, 205/2, and 203/2 models are above it). Its a stand-mounted minimonitor that retails for $5000 USD per pair and is, without a doubt, one of the most advanced small speakers on the market today. At the heart the 201/2 is the newest version of KEFs Uni-Q driver technology, which the company first released in 1988. Uni-Q is a coincident driver technology that KEF didnt invent but which the company does seem bent on perfecting. A coincident driver is one where the tweeter driver is located within a larger cone-based driver, occupying the space normally reserved for the dustcap. In the case of the 201/2 (and all the KEF Reference models), its a 1" titanium-dome tweeter that delivers the highs inside a 6 1/2" cone thats used for midrange frequencies. Fourth-order slopes cross over the drivers at 2.5kHz. The advantage of the coincident approach is that it aligns the acoustic centers of the two drivers, so no matter where you are around the speaker -- in front, left, right, above, below -- your ears are always the same distance from both drivers. This is a very good thing, and quite unlike the technology used for virtually all other speakers on the market, which use separate drivers for discrete frequency bands. With separate drivers, the distance from your ears to each driver varies depending on where you move. However, as with almost everything in audio, there are tradeoffs. One disadvantage of a coincident driver is that the tweeter is now working within the cone that surrounds it, which affects its output characteristics. In fact, with most coincident drivers, the compromises introduced by having the tweeter inside the cone overshadow the benefits, which is precisely why so many companies still use separate drivers. With the Uni-Q driver, though, KEF claims to have overcome many of the limitations through clever engineering. For example, the Uni-Qs cone is shallow to reduce the "throaty" effect of a deep cone. Its also shaped so that it acts as an ideal waveguide for the tweeter, which, in turn, optimizes the tweeters dispersion at lower frequencies, resulting in a smoother driver-to-driver handoff in the crossover region. Furthermore, the cones surround is flat, which reduces the diffraction effects that a rounded driver surround would introduce. Smart. Theres another advantage to the Uni-Q concept: speaker orientation. Although most people will use the 201/2 positioned vertically, because of the uniform dispersion characteristics of the Uni-Q driver its possible to lay the 201/2 on its side if need be -- used as a nearfield monitor on a studio console, for example -- and it will still sound right. You cant do that with speakers with separate drivers, at least if you want them to sound exactly the same. To accommodate this positioning flexibility, KEF supplies a simple but effect curved rubber mat that supports the 201/2 horizontally. But theres far more to the 201/2 than just the Uni-Q driver. The 201/2 is a true three-way design -- you dont often see three-way stand-mounted speaker, especially of this size -- with a 6 1/2" paper-based woofer thats crossed over at 450Hz to the Uni-Q cone driver, once again with fourth-order slopes. Having that dedicated woofer relieves the midrange of having to reproduce bass frequencies and, likewise, it means that the bass driver doesnt have to travel up into the midrange. KEF claims a -6dB point of 44Hz for the 201/2. Around back, there are three sets of binding posts, allowing you to tri-wire the 201/2s if you wish. (Short jumper wires with terminations are supplied for people who don't want to tri-wire.) Youll also see three small screw-in devices -- they look like plastic-capped bolts -- that offer a very welcome feature: high- and low-frequency contouring. Depending on which of these "caps" (KEF's term) are used, the bass response can be left flat or decreased by 2dB, and the high-frequency response can be left flat, increased by 0.75dB, or decreased by either 0.75dB or 1.5dB. As I said, this is a welcome feature, mainly because it allows a bit of sonic tailoring to better suit the speaker to your room or the electronics youre using. But I have two caveats about KEFs use of these screw-in caps. First, I found the "cap in" and "cap out" terminology confusing, and I always had to look at the manual to know what was what. For example, a completely "flat" presentation occurs when the left and right caps are in, but the center one is out. Intuitive? No. When all caps are in -- thats how the 201/2 is shipped -- the bass is flat, but theres a 0.75dB rise in the treble. Frankly, with nothing marked on the back of the speaker, its tough to keep straight. Second, and more important, the screw-in caps present a small household hazard that I actually never thought of because my listening room is sealed off to my young son, but two people who saw the caps commented on immediately. Because the screw-in caps go in and out relatively easily and they dont actually lock in, they can become a choking hazard for a child. As I said, my room is isolated from the rest of the house with a locked door, but, depending on how accessible the listening room is, this could be a legitimate concern. In fact, once it was pointed out to me, I wished that KEF had made the "flat" setting (which is what I used mainly) with all caps out, or made it so the caps actually locked in place. Its a flaw in this otherwise extremely well-thought-out design. As for the KEF-supplied specifications, most are rather ordinary, but a couple do stand out. The sensitivity is said to be 86dB (although not specified, Im assuming its at 1W/1m under anechoic conditions), with an average impedance of 8 ohms that drops to a low point of 4.2 ohms. This is basically par for the course for most three-ways speakers. KEF recommends a minimum of 50Wpc from the amplifier to make the 201/2s sing, and that seems right. As for standing out: KEF claims a maximum output level of 110dB. I have no idea if that was measured at 1 or 2 meters, but, regardless, thats loud -- really loud for a small speaker like the 201/2. Furthermore, KEF claims frequency response to be +/-3dB from 55Hz to 60kHz. The 55Hz didnt surprise me, and neither did the +/-3dB part, but the 60kHz part did. Thats serious treble extension. Finally, the cabinet itself -- the most apparent part of the speaker -- cant be overlooked. Its a sculpted beauty that measures 16 1/2"H x 10"W x 16"D and is made mostly from birch plywood that feels extremely solid. The curved side panels round completely at the back, and the headshell that supports the Uni-Q driver swoops out of the top. 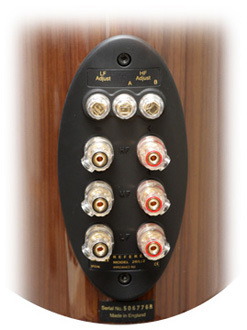 The speakers port is cleverly located on the top, behind the headshell, meaning you can install the 201/2s close to a wall and not obstruct the port. Good-looking grilles are supplied to cover the drivers, but they are sonically obtrusive, so, for serious listening, leave them off. Each 201/2 weights about 27 pounds and is available in piano black, high-gloss cherry, high-gloss American walnut, and satin sycamore finishes. 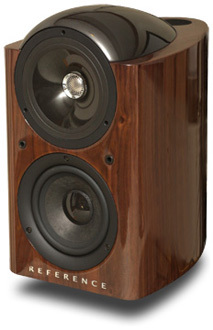 I was quite taken with the 201/2s design and thoroughly impressed with the speaker's high-quality workmanship. Its a first-rate product through and through. The 201/2 is obviously a serious attempt at redefining expectations for the ultimate stand-mounted small speaker, not just in terms of technical prowess and features but sound quality as well. So you should partner it with the best equipment, which I did. I used the 201/2s with all Simaudio Moon Evolution electronics: SuperNova CD player, P-7 preamplifier, and W-7 stereo amplifier. Interconnects were balanced Nordost Valhalla, and the speaker cables were a single run of Nirvana S-L. There are matching stands available ($500 per pair), but KEF America didnt supply them. Therefore, the 201/2s sat atop my 24"-high Foundation stands. The 201/2s impressed me right off. They sounded "ultra-tight," maintaining iron-fisted control from the bass up through the midrange, which made percussion really come alive. In addition, they could play as loud as I would ever need them to without ever sounding strained -- louder, in fact, than PSBs Platinum M2, my previous reference for big-speaker output levels from a stand-mounted design. Even the bass, which is often the Achilles heel of small-speaker designs, was impressive -- not so much for its depth, but for its tightness and control. In my room, the 201/2 reached firmly to under 50Hz -- as low, really, as any stand-mounted speaker can be expected to go without sacrificing too much sensitivity -- and then reproduced everything from there on up with as much transparency, clarity, and detail as Ive heard from any dynamic speaker. I let rip with Johnny Cashs American IV: The Man Comes Around [American 4400770830], a raucous recording that Ive enjoyed punishing speakers with, both big and small. The title track as well as "Bridge Over Troubled Water" can sound hard in the lower midrange when played at high SPLs. However, the 201/2s stayed remarkably composed, remaining clean and articulate even as I pushed the volume level higher and higher with the seemingly endless pit of power that the W-7 amp provides. It was only when I was at far-beyond-normal listening levels, which was much further than I push most speakers, that I sensed strain. But even then, I couldnt be sure if it was the speakers, my room, or my own ears that were at fault. At that point, everything was just loud. What I do know, though, is that the 201/2s sounded remarkably clean, detailed, and tight, whatever the volume level I chose. They were as neutral as any speaker Ive heard, although it took some time for this aspect to develop. Obviously, the very lowest bass was missing, but thats to be expected from a stand-mounted design (KEF also has two Reference subs, the 208 and 209); it was the highs that were putting me off. At first, the 201/2s seemed too hot in the top end. In fact, they were on the brink of brightness, and had things remained that way, I wouldnt have been very enthusiastic about them at all. Thats when I figured out about the screw-in caps on the back. As I mentioned, the 201/2 ships with all the caps in, tilting the balance in the top end up 0.75dB. That may not sound like much, but in my system and my room, it was noticeable enough to be off-putting. Removing just that middle cap, however, which flattens the speaker across the frequency band, ameliorated my high-frequency concerns, making the 201/2s ideally balanced from head to toe and still as airy and extended as the best speakers I heard. Maybe someone will opt to tame the top end even more -- two more increments of -0.75dB each are available -- but I didnt feel the need to. With that one cap out, the 201/2s were as close to perfectly balanced as any small speaker could be. Furthermore, despite the neutrality and high degree of detail theyre capable of, the 201/2s didnt come across as cold, clinical robots, as some linear, highly revealing speakers do. Instead, they were surprisingly fleshed out and well textured, making voices sound rich and lifelike. Marta Gómez's singing on Entre Cada Palambra [Chesky JD301] was striking for its combination of purity and presence, with placement in the hyper-detailed soundstage that was very precise. Much the same can be said about the way the 201/2s reproduced male vocals. The Eddie Vedder-penned soundtrack for the movie Into the Wild [RCA 715944] is recorded startlingly well. On "Society," Vedders voice popped into the stage with richness, texture, and dimensionality that sounded so good through the 201/2s that it didnt leave me wanting for anything more. Acoustic guitar on both the Into the Wild and Entre Cada Palambra discs was reproduced with such precision and purity that I kept writing in my listening notes, "Clean, clean, clean." The 201/2s sounded so clean, in fact, that every little nuance came through, including information about the recording venue, resulting in a remarkable depiction of space with the soundfield hovering along the speaker plane, extending at times a little beyond each speakers boundary, and then portraying as much depth to the front of the room as each recording would allow. When I pulled out my old soundstaging-and-imaging standby, the choral-based soundtrack to the movie The Mission [Virgin CDV2402], the front end of my room was enveloped in a soundfield that defied the speakers size. The 201/2 is a high-resolution small speaker for the home, but it would be just as valuable as a recording monitor in a studio. In fact, the overall performance of the 201/2 left me with nothing to fault, which rarely occurs with any audio product, regardless of price. As a result, insofar as my experience in reviewing loudspeakers goes, I can only say that the 201/2 is the best stand-mounted speaker Ive heard in my system. I was so impressed with the 201/2s that early on I phoned SoundStage! editor Marc Mickelson to tell him about them. I didn't know what the 201/2s cost a that point, and Marc made an off-the-cuff guess: $3000 per pair. We figured out Marc was mistaken shortly thereafter, but in the meantime all that I could think about was the speaker Id just reviewed -- the Usher Audio Be-718, which retails for $2695 per pair. I wondered if I had whiffed on the '718s by praising them so highly and then finding out that I liked the 201/2s, which I thought cost about the same, even more. When I learned that the 201/2s were actually $5000, I was relieved. The world made sense again. That takes nothing away from the Be-718s. 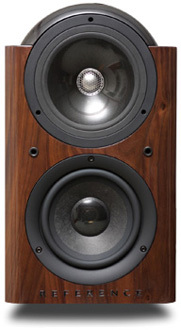 They are still one of the best speaker values under $3000. However, the 201/2s are a clear step up in terms of build quality, features, and sound quality too. The 201/2s not only play louder, theyre cleaner and divulge even more detail than the Be-718s, particularly in the midrange and upper bass. The Be-718s do extend lower in the bass, but the 201/2s sound a touch tighter and seem to have better control from the bass up through the mids. Still, these differences arent commensurate with the price -- i.e., the 201/2s arent twice as good. But they are incrementally better across the board, except for the low bass, and people with some extra money who want to go all out for a state-of-the-art small speaker need to look into the 201/2. Those without that much money to spend can stay with the Be-718s and be assured theyre getting something thats almost as good as it gets. Even more interesting, though, was comparing the 201/2s to the Dynaudios Confidence C1s ($6500 per pair). Ill cut to the chase and tell you that the C1 is also an amazing performer, with a relatively neutral balance but a surprisingly rich and robust sound -- more so than the 201/2. As well, at least subjectively, the C1 extends deeper into the bass, more like the Be-718. However, a pair of C1s costs even more than 201/2s, and although I really liked the sound of the C1s, I liked the 201/2s' more. For example, the C1s sound remarkably fleshed out, but I preferred the 201/2s comparatively leaner, more visceral presentation. To me, the 201/2s sounded more detailed, and this revealed more of the recording -- something I favor. Furthermore, I found the 201/2s a touch cleaner-sounding, particularly at higher volume levels. Basically, they held their composure better. I also thought that the 201/2s laid out a larger, more precise soundstage, likely due to their being such a high-rez design. However, the C1 has strengths too, like the robustness that the 201/2 doesnt quite match and that deeper bass that others may certainly favor. Therefore, sonically, theres no real better or worse. Preferences will dictate. Aesthetically, I find the 201/2s far more pleasing, and their overall construction, including cabinet shape along with fitnfinish, is a clear step beyond most speakers that I see, including the C1, which seems rather ordinary in comparison. In addition, the 201/2 has frequency-response tailoring that many speakers dont have, and this can be helpful for fine-tuning the speakers to your room. And lets not forget that a pair of 201/2s is $1500 less than a pair of C1s. For audiophiles, advanced technology and a wealth of features dont mean much if they don't translate into greater fidelity. In fact, Ive seen far too many speakers that have a heady parts list accompanied with bold technical claims but dont end up performing well in the anechoic chamber and certainly dont sound any better in the listening room. When that happens, I think, "Whats the use?" KEFs Reference 201/2 is a different breed. The 201/2 is not only one of the most innovative, versatile, feature-rich, and finely constructed stand-mounted speakers Ive reviewed, but its also the best-sounding as well. In fact, my only quibble with it is those screw-in caps. While $5000 is quite a lot of money for a speaker that needs to be propped up off the floor, it certainly isnt too steep a price for the 201/2 when you realize that you can pay a whole lot more for a speaker and get considerably less. Furthermore, I dont know of a speaker priced less than the 201/2 that offers the same collection of strengths, even among the many so-called "giant-killers." As a result, the 201/2 can stand tall among the best of the current stand-mounted speaker designs, and it puts KEF back on the map as a leader in applying advanced technologies that result in better-sounding loudspeakers. The big British brand name of my youth is back, and based on my experience with the 201/2, it's better than ever. Price: $5000 USD per pair.